The principle behind heat recovery is to continuously supply fresh air and extract stale air, changing the air in your home up to ten times a day. 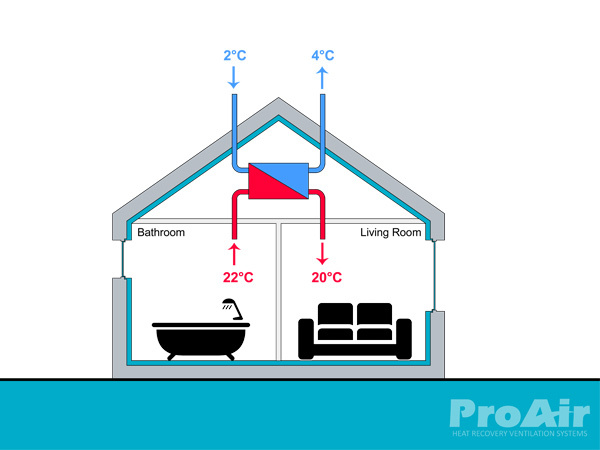 Air is supplied to living areas and bedrooms, and extracted from wet rooms such as the kitchen, utility and bathrooms. This means that the humid, stale air that is created when cooking, cleaning and showering is removed at source to avoid issues arising from condensation and moisture, such as mould growth. This air is replaced by fresh, filtered and warmed up air from outside. This will provide a healthy and comfortable indoor environment in your home. At the heart of our ProAir system is a counter flow heat exchanger. The heat exchanger is designed so that air flows in tiny triangular ducts where each warm triangle is surrounded by three cold triangles and vice versa. The warm and cold air flow in opposite directions without ever mixing together. As the air moves through the heat exchanger the heat is transferred from the moist, stale air to the fresh, filtered air. This means the air coming in from outside will have recovered up to 93% of the heat available. This means the air being supplied to your home both is healthy and warm. Adding to the efficiency of the exchanger is that air will flow uniformly and smoothly through the channels in an uninterrupted flow pattern. 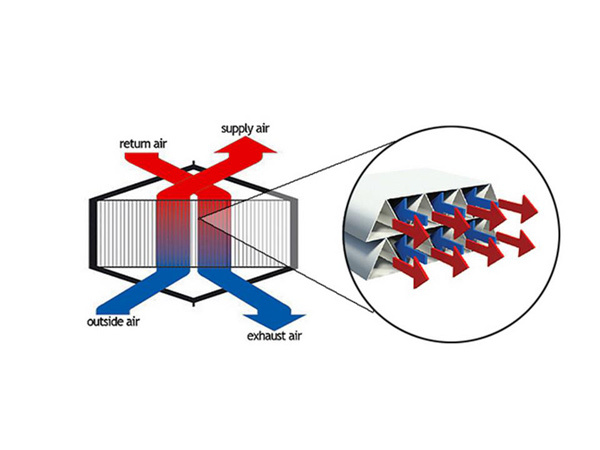 The video below explains in more detail how heat recovery works.